Hexploitation Film Festival: Help Make FIST OF JESUS Into a Feature Film! Help Make FIST OF JESUS Into a Feature Film! David Muñoz & Adrian Cardona's hilariously bloody short film FIST OF JESUS is on its way to becoming a feature film...and you can help. igg.me/at/fistofjesus Once Upon a Time in Jerusalem from Fist of Jesus on Vimeo. FIST OF JESUS was an official selection of Fright Night Theatre in 2013 and winner of BEST FILM, BEST KILLS, and BEST GORE at the 2013 Hamilton Zombie Short Film Festival. Fist of Jesus imagines what would happen if Jesus's miraculous gift for resurrection unleashed a zombie curse of biblical proprtions. Slapstick carnage ensues in the tradition of Peter Jackson's Dead Alive and Sam Raimi's Evil Dead 2. 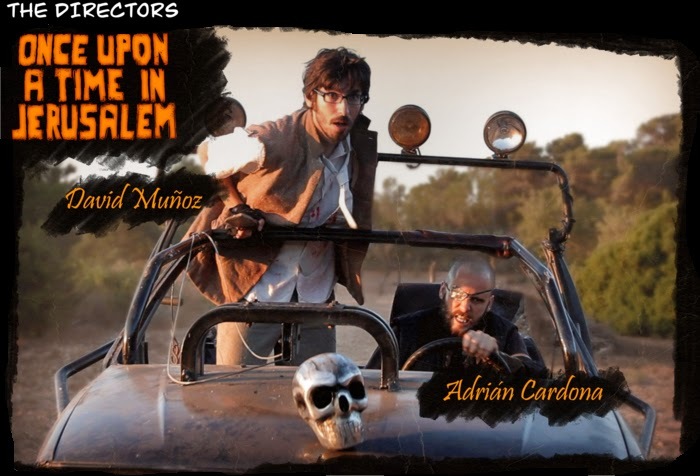 Now, Muñoz and Cardona are now seeking funding on INDIEGOGO to adapt their short into a 90-minute feature film: Once Upon a Time in Jerusalem. It promises Zombies, Demons, post-apocalyptic Punks, Mutants, Cowboys, the Roman Army, Monsters, Mythological Creatures and Steampunk technology. After wiping out an entire village whilst trying to raise Lazarus, Jesus decides to go to the Oracle of Delphos for advice. The witches reveal to him that he must go on a perilous journey. He recruits twelve ruthless mercenaries, and sets off, ready to burn his name into the pages of history. Once Upon a Time in Jerusalem -- the Fist of Jesus movie -- must become a reality! Help these intrepid and brilliant young filmmakers reach their funding goal before JUNE 13, 2014 and score yourselves a copy of the film and other heavenly booty in the process.